Religious education provokes challenging questions about the ultimate meaning and purpose of life, beliefs about God, the self and the nature of reality, issues of right and wrong and what it means to be human. It develops students’ knowledge and understanding of Christianity, other principal religions, other religious traditions and other world views that offer answers to questions such as these. It offers opportunities for personal reflection and spiritual development. Religious Education is concerned with the deep meaning that individuals and groups make of their experiences and how this helps them give purpose to their lives. The purpose of Religious Education is to help students to reflect upon the experiences and the mysteries of life and the contribution of religious and spiritual dimensions. Religious Education is taught by Ms Holland (Head of RE), Ms Petrovics, Mr Dyer and Mr Williams. At KS5 students will study the OCR Religious Studies course. This course is split into three units, Philosophy of Religion, Religious Ethics and Developments in Christian Thought. It is examined by three, essay based, exams at the end of Year 13. Students will study ancient philosophers such as Plato and Aristotle, as well as debating issues such as the problem of evil and the existence of God. In the Religious Ethics unit, students will apply ethical theories to situations in order to delve into human morality and motivations for making decisions in ethical dilemmas. The Developments in Christian Thought unit explores theological issues such as how we can know anything about a transcendent God and whether Jesus was the Son of God or merely a teacher of wisdom. Students are set weekly homework and expected to complete regular essays in order to practice their ability to develop and criticise arguments. 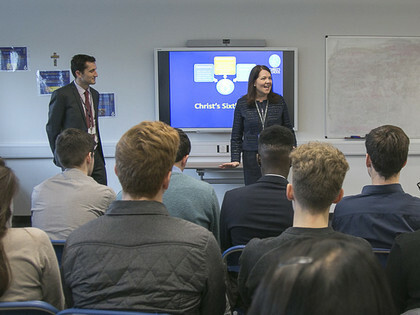 Students have the ability to develop their understanding of philosophical, religious and ethical issues through a number of extra-curricular activities. Year 12 and 13 students attend lectures delivered by Drs Peter and Charlotte Vardy to supplement their A Level studies. Religious Education provides students with a range of skills which are transferable to a number of different A Levels and degree subjects. The subject encourages students to think critically, analyse texts and develop arguments. These are essential skills within all humanities and social sciences subjects.